Explanation: A comet bright enough to be seen with binoculars is swooping into southern skies. Comet C/2000 WM1 (LINEAR) continues to brighten and develop tails as it nears its closest approach of the Sun in late January 2002. Comet LINEAR WM1 was discovered over a year ago when it was out past Jupiter and still very faint. In the above picture from the Curtis Schmidt 0.6-meter Telescope in Chile, a 30-second exposure in red on December 4 captured detail in Comet LINEAR WM1's emerging dust tail. Optimistic sky watchers hope that Comet LINEAR WM1 will undergo an even greater (and unexpected) brightening to the point where its coma and tails are easily discernable to the unaided eye. 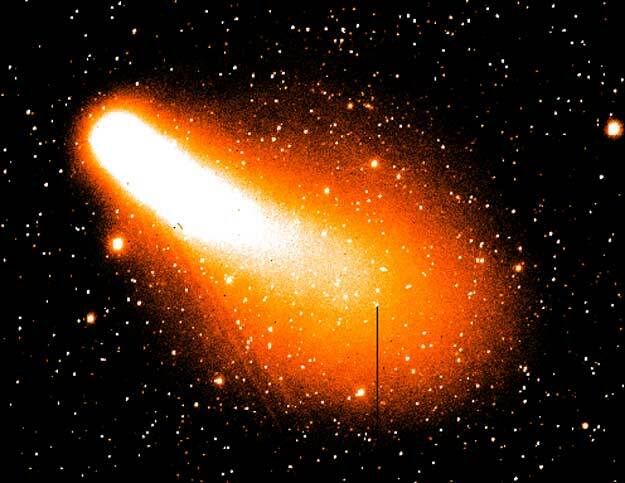 Comet LINEAR WM1 is being watched with particular interest by astronomers because its ion tail might yield clues to understanding the solar wind expelled from near the Sun's poles.